I guess I figure mint brownies are a natural St. Patty’s dessert not because of any Irish affliliation, but because of the green frosting. These are my two favorite. 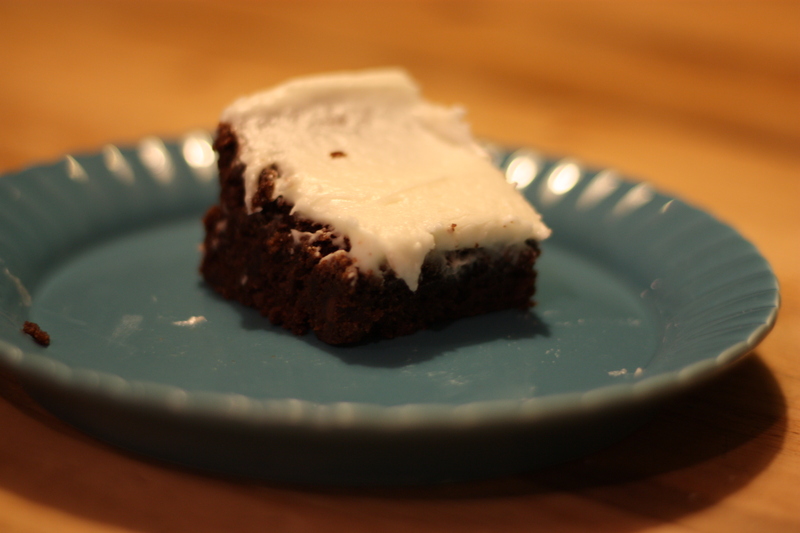 I post the BYU mint brownie recipe because I fell in love with mint brownies there. Although this is supposedly the real deal (from an alumni magazine), I don’t know that it tastes the same as the sheets that come out of BYU catering–but a good enough substitute. For the icing, soften butter. Add salt, corn syrup, and powdered sugar. Beat until smooth and fluffy. Add extract and coloring. Mix. Add milk gradually until the consistency is a little thinner than cake frosting. Spread mint icing over brownies. Place brownies in the freezer for a short time to stiffen the icing. Remove from the freezer and carefully add a layer of chocolate icing (if desired). Heat oven to 350. Greae 9 x 13 pan. In a bowl, combine flour, sugar, butter, eggs and syrup. Beat till smooth. Pour into pan and bake 25-30 minutes. Cool. Combine all mint cream ingredients and beat until smooth. Spread on cooled brownies and refrigerate until cold (1-2 hours). Melt butter and chocolate chips over low heat or in the microwave at 30 second intervals. Pour over chilled dessert and cover and chill 1 hour.